Merci Suárez and her brother Roli are heading off to school in Florida. Life will be very different this year. Seaward Pines Academy is rather expensive. Can they handle being scholarship students? 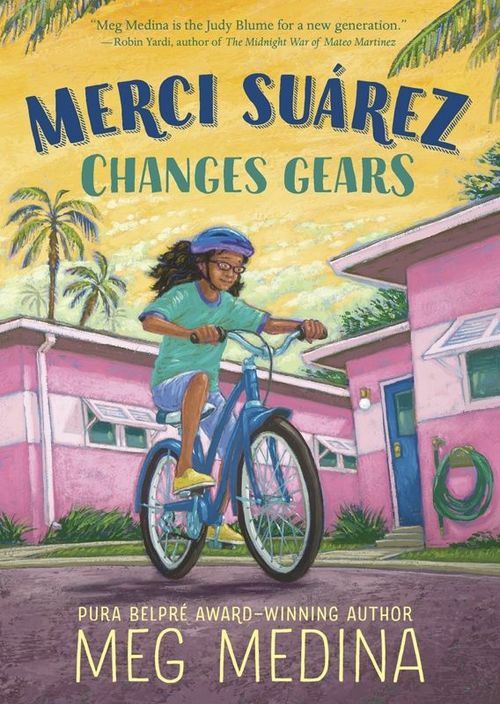 MERCI SUAREZ CHANGES GEARS appeals to the newcomer in all of us, because we've all lived that first day in a new place over and over through our lives. Sixth grade is challenging enough without Edna Santos deciding everything for the class. Merci describes her middle school in the present tense, carrying us along to get school photos. When I was in school, nobody told us the school made lots of money out of those photos. Merci knows. And these days everyone takes phone photos! She also has some tasks to complete, like community service to make up for their free tuition (this includes painting school walls with her Papi during the vacations). Merci and Roli find a police cruiser in front of the house where their Abuela, grandmother, lives with Grandfather Lolo. Seems he has been acting forgetful lately, and had to be brought home by the helpful officers. Lolo was always on the kids' side. Mami is a physical therapist and can't be around all day, and she is determined that her two kids are going to have a good education. Roli is into science projects, but Merci is sporty, and she's not pleased to be assigned more service time as a buddy to someone brand new, Michael Clark. She barely knows her way around and now she has to shepherd some guy she's never met instead of going to sports tryouts. Meg Medina artfully draws us into the world of the quite normal kids, showing us how the Ednas of life try to set standards and pour scorn even with silence. I think being successful is the best revenge. Beloved grandparents start to show their age. That's life. Merci suddenly has to worry about Lolo's diabetes, falling off bikes and getting mixed up, so she is taking on added responsibility. The more I saw of this resourceful, kind young lady, the more I liked her. From the start in September to the cheerful cries of 'Feliz Navidad' at the end, I had fun meeting Merci's multigenerational family. MERCI SUAREZ CHANGES GEARS to cope with a climb, and by the end, we know there are more hills to face in her future. But that's okay, because she's pretty sure she can cycle to the top. Young people everywhere will enjoy this book and learn a lot.